With the help of Siri (voice interface), people can have a call, add tasks, have a search. 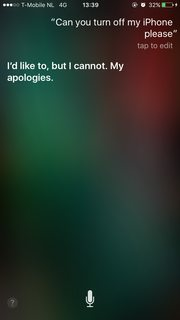 I give a command for turning off my phone but Siri said that "It is beyond my skills". I tried again and Siri responded as "I'd like to but I cannot". Why are some of the voice commands like "shutting down the device" not accepted? Is there any user experience related issue with it? I first thought that it is related to security related issue but this can be solved by implementing same strategies like confirmation/alert boxes? 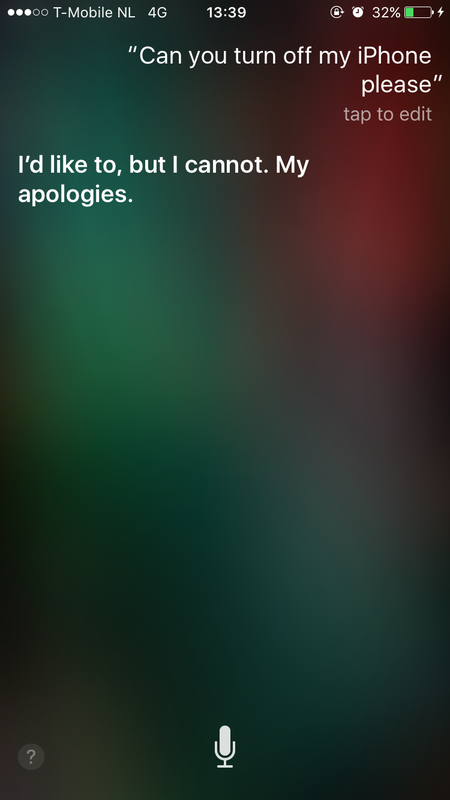 Do you have any solid answer for why Siri can't turn off my phone? Can the other voice command assistances (ex: Alexa or Cortana) handle such requests or not? Shutting down is a relatively uncommon action (for dealing with your example about getting undesired calls, the do not disturb feature and airplane mode are much more convenient). There are sometimes issues identifying the intend of the user based on voice input. It would be very inconvenient and potentially confusing when the phone would shutdown due to a wrongly interpreted command. The opposite command (turn the phone on) is not possible to give as Siri doesn't work when the phone is of. Creating an API for shutting the phone down could be the start of potential security threats. Perhaps in earlier versions of iOS the voice recognition feature is not as mature, and I have experienced times when I was able to tell Siri to perform certain tasks on my friend's phone. If this is the case, you certainly don't want other people with similar voice to be able to shut down your phone. Not the answer you're looking for? Browse other questions tagged confirmation alerts command voice or ask your own question. Should the user be given an option to turn off confirmations?